As mentioned previously, please bring along an ECG or Holter of a difficult pacing indication. Valve Disease-TAVI vs Surgical AVR? As ever from 7 pm refreshments and a buffet will be provided courtesy of St Jude Medical. All are welcome, please pass on the invitation to any interested professionals, no need to confirm attendance in advance. 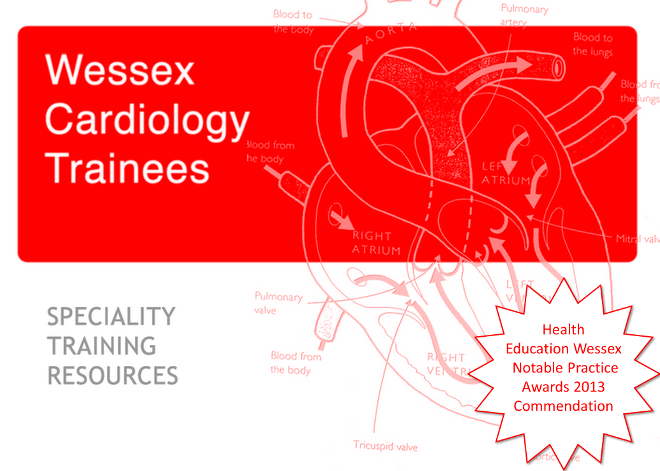 A highly recommended course utilising simulation and hands-on training in a pan-interventional environment ranging from peripheral vascular, coronary and structural interventions. Places are limited per speciality (Interventional cardiology, cardiothoracics, radiology and vascular surgery) and so early booking via the website is recommended. The course also provides a fascinating environment for interaction between disciplines with cross-over in interventions and skills. Course fee is £600 which includes all meals and accommodation. If you have any specific questions about the course, please contact Bristol trainee Ali Khavandi. Dr. Sam Fitzsimmons, Wessex trainee and STC link, has posted the minutes from the recent meeting. Thanks to all those who provided questions. Topics covered include recruitment, ARCP/RITA, e-portfolio and sub-speciality training, amongst others. Further details about the programme at Portsmouth later this month to follow. In the meantime, a message from Dr. Dominic Kelly, Wessex SpR and Device Fellow, Bournemouth. I've been asked to present "indications for pacing" at the Portsmouth training day. The topic has the potential to be rather dull so I thought what would be better is if everyone could bring 1 ECG, 24hr tape or other, of a grey pacing indication and we could discuss each in the context of current guidelines.